MY Tips to make the KT Tape stick! 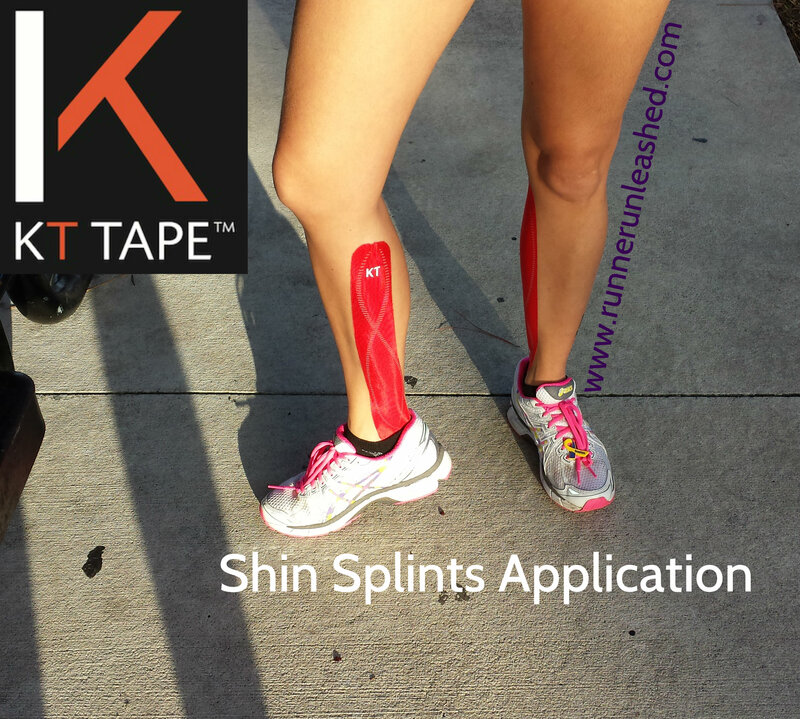 KT Tape has tons of different applications. I love the tape because I can use it on almost any pain. It is also non medicated, as a person who doesn’t use medication as my first option, this is a great alternative and speeds up recovery! My most common use of the tape is for my Scoliosis, shin splints, and hip flexor. But once in a while something else flares up on my and I put that tape right on! I mainly use it when I am getting ready for a run, but doing daily normal activity at home my Scoliosis always gets in my way so I will apply it. The last incident that happened was while I was eating. As I lifted the fork..I got a severe pain in my back(happens often to me). As a fight or flight response I dropped the fork, no longer could move my arm. Since my pain is normally in my upper right back/shoulder, any movement I did would send a burning sensation into my spine. From experience I know that is nerve pain. My back was swelling and the pain was growing. It was a very tense, uncomfortable feeling. My husband applied the KT Tape, and I kid you not, almost immediately I feel my muscles relaxing and no longer feel the tension and stiffness I had. 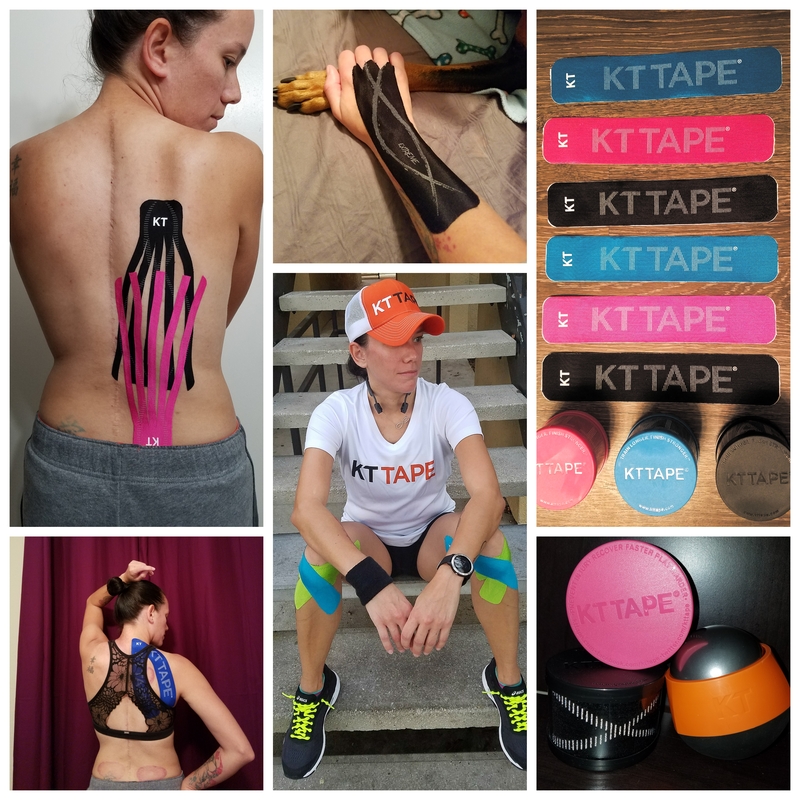 I stand by KT Tape because after all the back therapy I have done, it is the only thing that allows me to do what I love…to RUN. I know a lot of you see the tape in almost all my photos lol, so I still get a lot of questions about it. Which I do not mind whatsoever!!!!! Keep the questions coming!! One question I get often is how I make my tape stick. I will give you all the tips I use to make the tape stick my skin. Normally the tape sticks with no problem, but sometimes it has an attitude and starts to peel off. If you ever have used the tape then you have seen the videos and notice that you are to apply the tape at the ends with NO stretch. The reason for that is because it sometimes starts to peel off. So with no stretch it doesn’t affect the rest of the tape. MY TIPS FOR KEEPING KT TAPE TO STICK TO YOUR SKIN!! TIP #1 Clean the skin with some warm soapy water. Everyone has different skin, oily, dry, sensitive, so cleaning the area properly helps for better adhesion. TIP #2 Shaving or trimming the area where the tape will be applied is pretty much a must! I know that for some men, having a shaved line down your quad is probably not something you want to do. If shaving is not an option for you then give the area a trim if possible. The tape needs to stick to as much as your skin as possible. If the area is covered in hair, it will barely stick if at all. TIP #3 Use rubbing alcohol to clean the area first. Using it will rid the area of unseen dirt and oil, giving the tape a clean fresh area to stick to. TIP #4 Use KT Tape Ultrastick. KT Tape also has a spray that helps the tape stick better. It provides a water proof adhesive surface for applying tape in extreme conditions. Anywhere from Oily Skin, Humidity, Sweaty skin and High temperature, helps the tape stick. TIP #5 Apply the tape hours before activity. It says to apply the tape at least one hour before running, but I apply mine at least 2 hours prior to a run. Make sure you rub it well once it is applied. The friction of the rubbing heats it up to stick on your skin. TIP #5 Use a hairdryer or place a heating pad on the area with the tape. Sometimes when my trap muscle is irritated and I apply the tape, I will use a heating pad along with it for better adhesion. TIP #6 Wrap the area with an ace bandage if possible. Some areas are easy to get to like arms and legs; when I use the shin splints applications, I sometimes wrap my legs with an ace bandage to give it a light constant pressure to the entire strip so it sticks to my shins. TIP #7 After cleaning the area properly, spray some hairspray onto the area you will tape up. Let it air dry and apply the tape as per the application steps. Using hairspray is VERY effective when running outside during these hot, humid, hot, sticky, and O yea..HOT Summer days!! This works because when it is humid, you start to sweat more. The beads of sweat your body produces created a barrier between the tape and your skin, therefore, the tape comes off. So using the hairspray, as your skin sweats it has the stick hairspray on it to keep the adhesion between the tape and your skin strong. =) This is working GREAT for me right now, because living in Florida training in the HOT Summer months, the tape does get affected. But using the hairspray, not even the edges peel off! YEA!! TIP #8 I wear long socks. Sometimes I don’t have time to tape up hours before to secure the tape, so I will tape up an hour before. Since I tend to dress up in costume for most of my races, I have a nice collection of long socks. So I will tape up, find the most breathable clothes I can, and put on the knee-high socks. I still sweat as normal, but the tape stays on because the socks are keeping it in place! It sounds like it would be too hot, but it’s not. It actually doesn’t bother me because the socks I wear are very thin. These are some of the things I do to make sure the tape sticks. Depending on the area some tips work better than others, but overall I don’t really have a problem making the tape stick. I hope these tips will help you all keep that tape on!!! You said to definitely use the KT Ultrastick, but you also say to use Hairspray, do you use both? Seems like you could use the hairspray in lieu of the Utlrastick? no? Excellent, thank you .. what is the name of that new product? I only see on the kttape.com site where you can buy 2 bottles together, ugh, I only need 1 for now, until I try it. Is it simple tape or adhesive tape ? 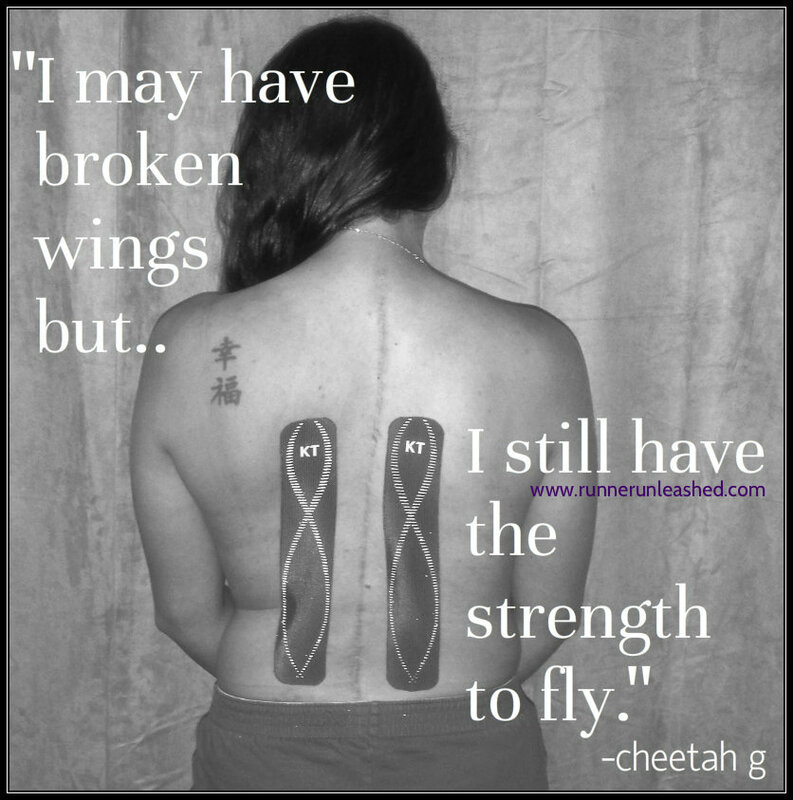 You are an inspiration for scoliosis patients like me too. You’re so brave to show your back and scars. I’ve dealt with this for 26 years and now have constant nerve pain the doctors call fibromyalgia and on tons of medication after 2 car accidents 10 years ago. I just wanted to send you kudos. Unfortunately my daughter has scoliosis now and is very active so we starting using Kt tape for her. Thanks to you we can use Kt tape for other pains and keep it on. Have you cleaned the area with rubbing alcohol first? Also once its taped you can lightly wrap it or put a sock on your foot and don’t do much activity for an hour to give it time to stick. If not then you could possibly have a bad roll and you can contact KT Tape for a new roll. I want to know if this tape stops pain? At 14 you think your invincible and then you have to g off and hurt something 😦 ! I’m a runner and my ankle hurts when I run. I’ve used kt tape and it works but I’ve never heard about the tips you mentioned! thanks and I look forward to trying them out! Also, and this might just be for my area, but I used to get the tape at CVS and it was something like $13 but my mom found it at Walmart for only $9! so if your looking to save a couple extra bucks, then I hope that helps. Thanks again! Very useful tips. I love the KT Tape but as a man, it keeps falling off my hairy legs mid-run. Going to try these tips. Ok. If you need more help let me know. They also came out with an extreme tape which sticks more. Previous Previous post: Run for your lives 5K!! 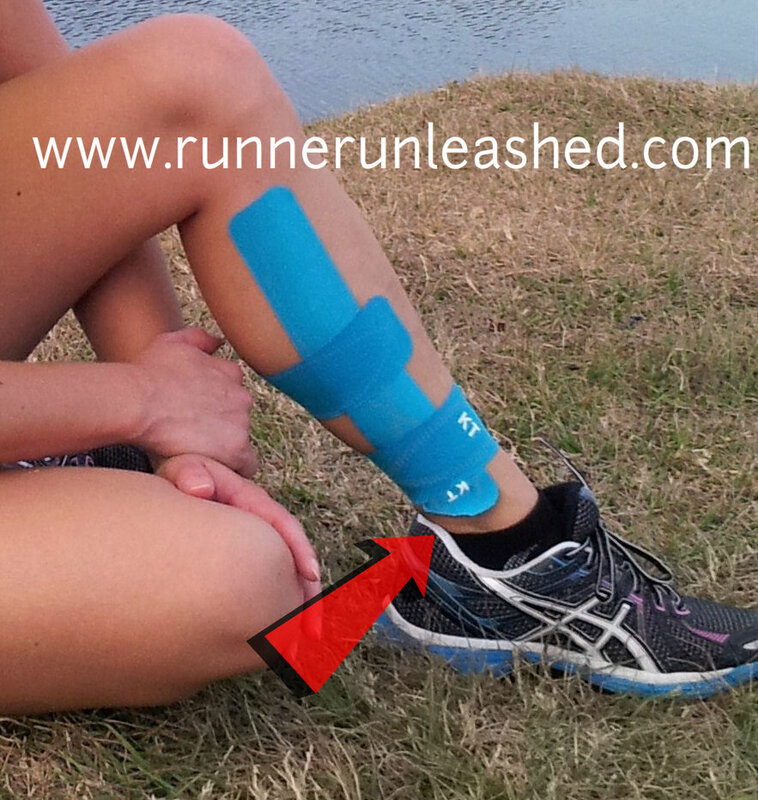 Next Next post: Are you running with a stress fracture?